Interested in reprinting music for congregational use? Visit our licensing partners at ONE LICENSE. Arrange or transcribe a song for non-commercial use by a custom ensemble. Email details to reprints@giamusic.com for a quote. Photocopy a song from an out-of-print publication. $1.00 per song, per copy. $25 minimum license fee. Photocopy a single song from a publication or collection. $1.00 per song, per copy. $25 minimum license fee. Reprint a song in a permanent worship aid for use by a church; valid for the life of the set number of copies. $40.00 fee per song, up to 500 copies. Please request a quote for 500+ copies. Email reprints@giamusic.com. Reprint a song in a product available for purchase. Email publication details to reprints@giamusic.com. Record a song for release on a physical product (CD), or record a song for release as a digital download. $0.091 (9.1-cents) per song per copy for songs up to 5:00 in duration; $0.0175 (1.75-cents) per song per copy, per minute, for songs 5:01 or longer in duration. $25 minimum license fee. Stream a recording online that is not downloadable. Use an original recording or a purchased recording of the song. $15.00 per song, per 6-month term. Email reprints@giamusic.com with details. Make a video of the live performance of a song or use a song in the background of a video for release as a DVD or a digital download. $0.15 per song per copy. $25 minimum license fee. Stream a video online (not for permanent download) with a song playing in the background. Use an original recording or a purchased recording of the song. $15.00 per song, per 6-month term. Email reprints@giamusic.com with details. Use a song in a public performance of a dramatico-musical work, either by live musicians or from an audio recording played in the background. $25 per song, per week, for amateur productions. For professional productions, please contact us for a quote. Email reprints@giamusic.com with production details. Use a song in a public performance outside of the context of public worship, either by live musicians or from an audio recording played in the background. $25 per song, per week, for amateur productions. For professional productions, please contact us for a quote. Email reprints@giamusic.com with performance details. 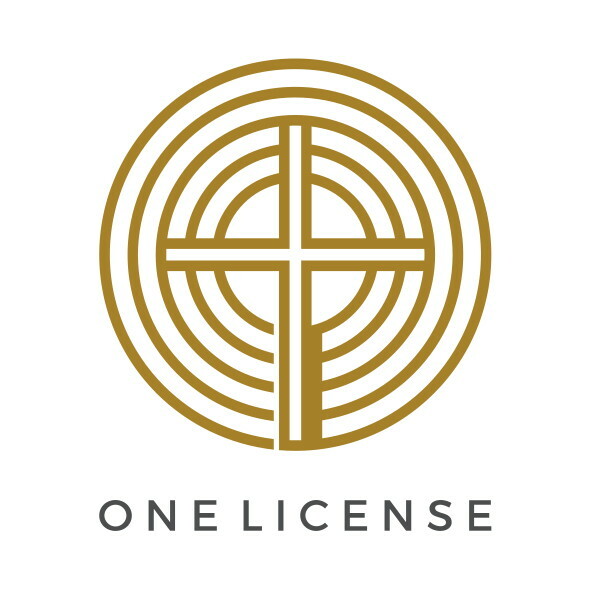 From Annual, Event, and Single-Use Reprint Licenses to Practice-Track and Podcast/Streaming Licenses, ONE LICENSE has a license that will meet your congregational music reprint needs. Visit http://www.onelicense.net to learn more. In the United Kingdom, congregational reprint permission (melody line and words) is available from ONE LICENSE, as well as Decani Music, http://www.decanimusic.co.uk/calamus-licence/. Elsewhere in Europe, our sub-publisher is Small Stone Media, http://www.smallstonemedia.com. If you do not see what you need on this list or on the ONE LICENSE website, please email your request to reprints@giamusic.com or contact GIA directly at 1-800-GIA-1358 or 708-496-3800.